A copy of BACL Sunnyvale’s A2LA ISO/IEC 17025 Certificate and Scope of Accreditation (which lists each of these EMC Emissions (and Immunity) Standards can be found by clicking here. 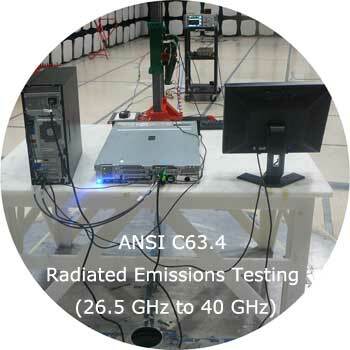 BACL Sunnyvale has the state-of-the-art EMC test facilities and test equipment needed to support both the development testing and the compliance testing of today’s complex products. 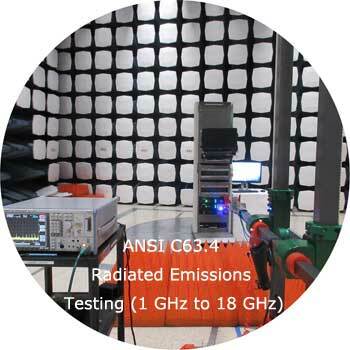 Our facilities include a large 10 m RF Semi-Anechoic Chamber that is primarily used for EMC Emissions testing at both the 3m and the 10 m measurements distances, and two 5 m RF Semi-Anechoic Chambers – one of which is primarily used for emissions testing of wireless device and licensed radio products. 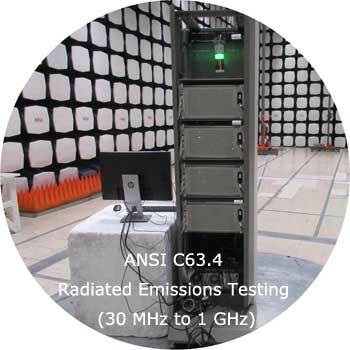 (The other RF Semi-Anechoic is normally dedicated to RF Radiated Fields Immunity Testing, but can be used for EMC Emissions Testing if our workload demands it). The walls and ceilings of each of BACL Sunnyvale’s RF Semi-anechoic Chambers that are primarily used for EMC Emissions measurements are lined with Ferrite Tiles that are covered with 4 ft. [1.22] RF Pyramid Absorbers on the walls, doors, and ceilings. Additionally, each of these RF Semi-anechoic Chambers is equipped with “loose laid” 12 inch [30 cm] pyramid RF Absorbers to simulate near free-space conditions when testing above 1 GHz, and, each has both a standard (planar scanning) Antenna Mast and a “Boresight” Antenna Mast. 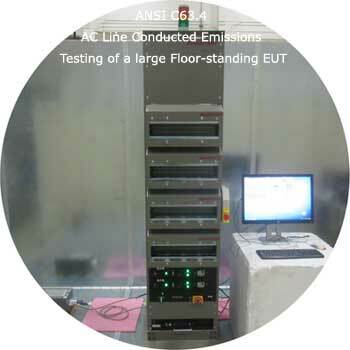 Each of BACL Sunnyvale’s RF Semi-anechoic Chambers that are primarily used for EMC Emissions measurements are fitted with EMI-filtered Lighting, EMI-filtered electrical power for EUTs and Support Equipment, and a remote video monitoring system. The floors of these chambers have access hatches that allow the passage of cables between each Chamber and its Control Room via metal-lined tunnels. All of BACL Sunnyvale’s RF Semi-Anechoic Chambers have their own dedicated, fully RF Shield Control Rooms, and each is equipped with EMI filtered lighting, EMI filtered electrical power for instrumentation and support equipment, EMI filtered HVAC, fiber-optic waveguide-beyond-cutoff and RF Bulkhead penetrations, and shielded tunnels that act as cableways for passing cables. Each of these Control Rooms includes a complete, dedicated suite of traceably calibrated EMC Test Equipment and RF Test Instrumentation. BACL Sunnyvale’s large 10 m RF semi-anechoic Chamber is fitted with a pneumatically-operated, 7’ 10’ [2.39 m] high x 6’ 7” [1.70 m] wide, double-knife-edge “EuroShield” RF shielded equipment access door. The “EuroShield” RF shielded equipment access door has a zero-height threshold that allows items of equipment to rolled in and out of the Chamber without the need for ramps or bridges. It also is fitted with a standard 7 ft. [2.13 m] high X 4 ft. [1.22 m] wide manually-operated single-knife-edge RF shielded personnel access door. 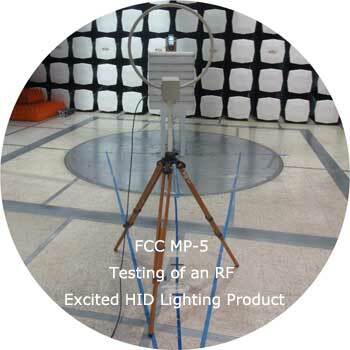 BACL Sunnyvale’s large 10 m RF semi-anechoic Chamber is fitted with a Sunol Sciences Model FM3044 3 m diameter solid metal Turntable that is electrically-powered, fiber-optically-controlled, and is installed flush-to-the-ground-plane-floor of the Chamber. The Turntable surface has a 5-inch [12.7 cm] diameter “bunny hole” that allows the passage of cables between the Chamber and the “Pit” located directly below the Turntable. 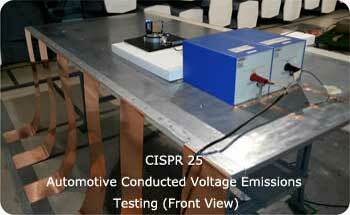 The Turntable is also fitted with various single phase, split-phase, and three-phase electrical power receptacles. (The electrical power is, of course, EMI Filtered). The turntable can be rotated through a full 360 degrees in either the clockwise or counter-clockwise direction. It has a distributed load capacity of 4 metric tonnes (i.e., 8,800 lbs.). BACL Sunnyvale’s large 10 m RF semi-anechoic Chamber includes an underground, fully EMI Shielded, 12 ft. [3.66 m] long x 12 ft. [3.66 m] wide x 10 ft. [3.05 m] high RF Enclosure (a.k.a. “the Pit”) is located immediately below the 3 m diameter turntable. 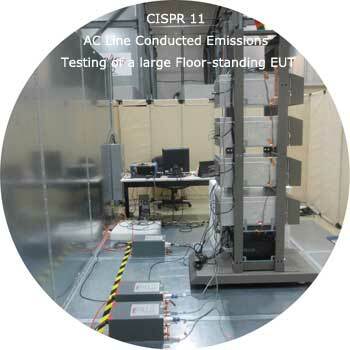 The “Pit” is accessible via a flight of stairs leading downward from the main floor of the test laboratory. Access to/from the “Pit” is via a standard 7 ft. [2.13 m] high X 4 ft. [1.22 m] wide manually-operated single-knife-edge RF shielded personnel access door. The “Pit” is equipped with EMI filtered electrical power outlets and with EMI filtered incandescent lighting. Both the Chamber and the “Pit” are supplied with electrical power that has been filtered via a bank of EMI Facility Filters. 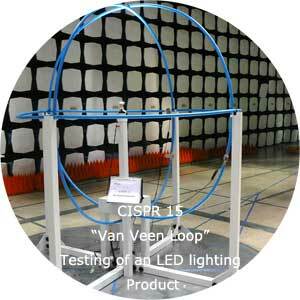 In particular, separate EMI Filtered 60 Hz / 120 VAC power circuits are provided for the two Antenna Towers (Masts), the 3m diameter Turntable, the ceiling-mounted recessed LED Array Panel Lightings, the in-Chamber instrumentation, and for power to both EUTs and Support Equipment. A four-pole (3-phase) 400 Ampere-rated EMI filter is used to feed DC, 50 Hz or 60 Hz Electrical power at up to 277 VAC per phase or up to 60 VDC to the “Pit” and the Turntable surface (via cables fed through the “bunny hole”) to provide power to EUTs and Support Equipment. Additionally, another four-pole (3-phase) 100 Ampere-rated EMI filter is used to feed DC, 50 Hz, or 60 Hz Electrical power at up to 277 VAC per phase to the to the “Pit” and the Turntable surface (via cables fed through the “bunny hole”) to provide power to EUTs and Support Equipment. Each of BACL Sunnyvale’s two BACL Sunnyvale’s large 5 m RF semi-anechoic Chambers is fitted with a standard 7 ft. high X 4 ft. wide manually-operated single-knife-edge RF shielded personnel and equipment access door, EMI-filtered Lighting, EMI-filtered electrical power for EUTs and Support Equipment, and a 2 m diameter Sunol Sciences Model FM2100VS solid metal Turntable that is electrically-powered, fiber-optically-controlled, and is installed flush-to-the-ground-plane-floor of the Chamber. Each Turntable surface has a 5-inch [12.7 cm] diameter “bunny hole” that allows the passage of cables between the Chamber and its Control Room. Each turntable can be rotated through a full 360 degrees in either the clockwise or counter-clockwise direction, and each Turntable has a distributed load capacity of 1 metric tonne (i.e., 2,200 lbs.). 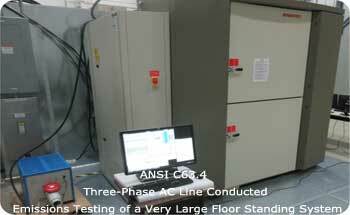 Additionally, our facilities include a large, dedicated Ground Plane Test Site (GPTS) that is used primarily for AC and DC Conducted Emissions testing. The GPTS consists of a large Ground Reference Plane and a large Vertical Coupling Plane (each constructed from modular shielding panels) that are bonded together along the full length of their mating surfaces using galvanized steel corner cove. A dedicated Ground Rod is installed immediately adjacent to the GPTS, and the GPTS is bonded to the Ground Rod via a wide bond strap. Specifically, the GPTS consists of a 12 ft. [3.66 m] wide X 10 ft. [3.05 m] long Ground Reference Plane and a 16 ft. [4.88 m] wide X 10 ft. [3.05 m] high Vertical Coupling Plane. The required AC Input Power Feeds, Circuit-breaker Panels, dedicated EMI Filters, and electrical receptacles for EUTs and Support Equipment are mounted on a pair of “wing panels” that are each 2 ft. [0.61 m] wide X 10 ft. [3.05 m] high; this results in a 12 ft. [3.66 m] wide X 10 ft. long by 8 ft. [2.44 m] high usable test volume. 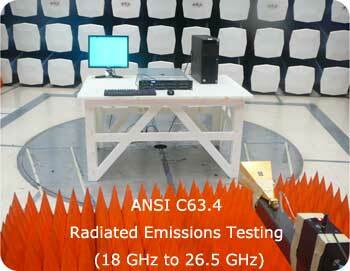 The GPTS has a complete, dedicated suite of traceably calibrated EMC Test Equipment and Instrumentation. 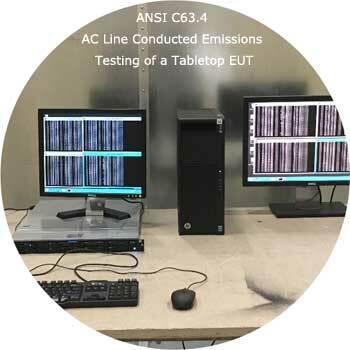 BACL Sunnyvale has all of the required test instrumentation, transducers, and test software needed to perform the EMC Emissions tests listed in our ISO/IEC 17025 Scope of Accreditation. All of these instruments and transducers have ISO/IEC 17025 –accredited traceable calibrations. 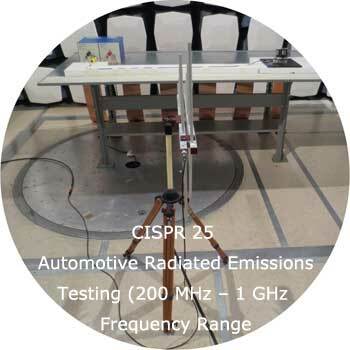 These instruments and transducers include: CISPR 16-1-1-compliant and ANSI C63.2-compliant, EMI Receivers that operate from 9 kHz to 40 GHz; Precision Spectrum Analyzers that operate from 100 Hz to 44 GHz, and Harmonic Mixers and Diplexers that extend the frequency coverage to 325 GHz; 32-Ampere-rated single phase LISNs/AMNs that operate from 150 kHz to 30 MHz; 3-phase, 100 Ampere-rated, 3-phase, 4-wire LISNs/AMNs that operate from 9 kHz to 30 MHz; a CISPR Line Voltage Probe that operates from 9 kHz to 30 MHz for use on EUTs that draw more than 100 Amperes of current, High-Pass Filters and Impulse Transient Limiters, an entire suite of EMI Receive Antennas (i.e., 41-inch Rod Monopole, Robert’s-type Dipoles, Biconical Dipoles, Log-Periodic Dipole Arrays, Hybrids, Double-Ridge Guide Horns, Standard-Gain Horns, and Precision Omnidirectional Dipoles) that have been calibrated per ANSI C63.5 and/or SAE ARP 958D (as applicable). 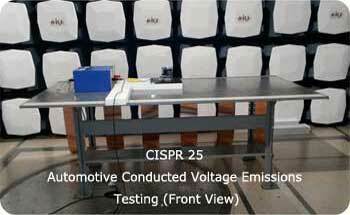 Additionally, BACL Sunnyvale has a California Instruments Model 5001iX Precision AC Source and a California Instruments Model PACS-1 Powerline Harmonics and Voltage Fluctuations/Flicker Test System. 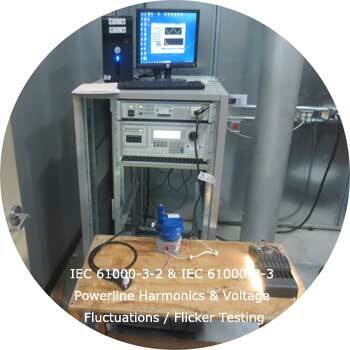 This system is designed to perform IEC/EN 61000-3-2 Powerline Harmonics testing and IEC /EN 61000-3-2 Voltage Fluctuations/Flicker testing on products powered from 50 Hz (single phase) that draw 16 Amperes of current or less.